Hey, it's 4th of July almost, right? And that's, like, a celebratory time. Let's do a giveaway! I have no idea how this works, except I guess people comment to enter and then I use some randomizer thing, right? 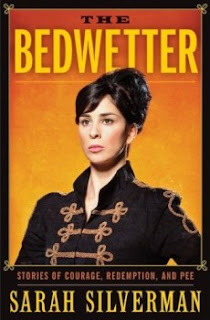 Because this is a spur-of-the-moment thing, comment if you want my fantastic, perfect-condition-but-read-by-two-awesome-people copy of The Bedwetter by Sarah Silverman. After I pick someone, I guess I'll message them or comment in their blog/whatever to get their address. You can tell which giveaway's mine by the fine attention to detail. Oh, and I guess you have to be a follower. I'm not having random nutjobs getting my book. And I guess this runs until...Wednesday? Yeah, sure, Wednesday. Edit: Aaaaaand the only entrant, Red, wins! Woooooooooo! Harry Potter: Awesome or Mega-Awesome?